. Previous topics have covered ways to make your website as successful as possible through tools such as Analytics and Website Optimizer. – Ed. Online video has become increasingly popular and it is now recognized as a very powerful medium for delivering a message. As more and more media companies and advertisers are embracing online video, and millions of people are uploading their own videos every day, building a following and reaching your target audience can be very challenging. 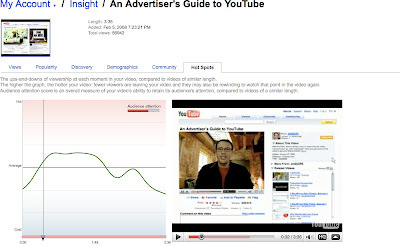 We developed a free analytics tool, YouTube Insight, as one way to help you do just that. Since the launch of Insight just over a year ago, we've been adding more features to help you better understand how the YouTube community is interacting with your video and grow your audience. Just like there is a "science" behind programming on TV, content owners and advertisers are becoming more sophisticated about how to gain optimal exposure for their content on YouTube. So how do you master this "science"? First, let's start with the basics. Monitoring viewing trends through Insight's "Views" tab can help you nail down the best time to upload your new videos. For example, Mondo Media uses Insight to monitor and predict surges in views of their strongest videos. They then time the launch of new episodes with these "waves" of traffic, making it easier for their existing audience to discover new favorites. Using Insight to increase their momentum on the site is one of the practices that have helped Mondo Media become the 6th most viewed YouTube Channel of all time. Insight has even more sophisticated features, like the "Discovery" feature, which shows you how your viewers found your videos (i.e., through search, an embedded player, related videos or viral sharing). Just like with websites, figuring out how visitors are coming to your videos can help you grow your audience. Using "Discovery," the band Weezer was surprised to find out that many of their followers were actually techies and not indie rockers: a large number of people had discovered their "Pork & Beans" video on YouTube through the embedded player on tech blogs. This finding led them to optimize their marketing strategy and shift funds in their budget to tech blogs for promoting their summer tour. Using "Discovery," you can also see which keywords are driving views and then advertise against these keywords using YouTube's Promoted Video product. You can see exactly how effective this method of promotion is and optimize your a spend in the future. Understanding which parts of your video people liked can be difficult, so we created the "Hot Spots" feature in Insight to show you the ups-and-downs of viewership for every single moment of your video, compared to videos of similar length. The higher the graph, the hotter your video, meaning fewer viewers are leaving your video and they may also be rewinding to watch that point in the video again. Understanding which parts of your video your audience likes enables you to make better content. The better the content, the more likely it is that viewers will send your video to their friends, kicking off the cycle of virality and helping you grow your audience. There are countless ways to use the data gathered from Insight to improve your YouTube numbers. Someone using YouTube to share a video of their vacation can just as easily use these tools as an advertiser working on a major campaign. And with our latest addition to YouTube Insight, you will no longer have to rely exclusively on the information you can get from the features described above. Last week we opened Insight, making your data exportable into CSV files. CSV files are open-format files that organize data so it can be moved and analyzed using common spreadsheet software such as Google Docs and Microsoft Excel. Now you can view and manipulate your data any way you like. Looking for ideas? Try comparing the view count for different videos side by side, mapping out where your viewers are coming from over time, or comparing discovery sources by country. Good luck to all the hopeful YouTube stars among you! This post is the latest in an ongoing series on The Power of Measurement. Previous topics have covered ways to make your website as successful as possible through tools such as Analytics and Website Optimizer. – Ed.